30th of January at 9pm. Price: €7. Box office: 0251.30300. Over the last five years an independent record shop has closed in the UK every three days. 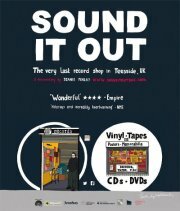 Sound It Out is a documentary portrait of the very last surviving vinyl record shop in Teesside, North East England. A cultural haven in one of the most deprived areas in the UK, Sound It Out documents a place that is thriving against the odds and the local community that keeps it alive. Directed by Jeanie Finlay who grew up three miles from the shop. A distinctive, funny and intimate film about men, the North and the irreplaceable role music plays in our lives. “Like a mint pressing in a bargain bin, Sound it Out is a rare find.” – new york times “Hilarious and incredibly heartwarming” – nme “A winning combination of High Fidelity and American Splendor.” – the guardian.